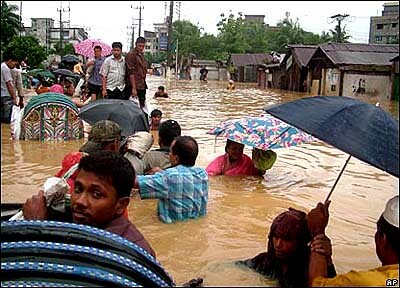 Image: Turmoil in Bangladesh during extreme floods. From the sacibgeography blog. "Climate change is now officially a human rights issue, as the UN Human Rights Council passed a resolution yesterday on the subject, recognising that the world's poor are particularly vulnerable." The UN Human Rights Council's resolution is important, because now there can - and should - be some acknowledgment that nations and communities who, by way of example, live in agriculture societies, like those in many already impoverished and drought-affected African countries, have a principled human right to exist productively in their habitat, or if being forcibly dislocated to another environment. And in the context where the earth takes these communities' climate conditions away though climate-induced and ravishing drought, followed by sandstorms, or through extreme flooding, those affected and becoming displaced people, or those who take initiative and knock on the door of the international community, either via the United Nations, or on an individual level - also those who arrive on a country's doorstep - can now claim the United Nations Human Rights Council or Commissioner as their advocate. On this page three reports about the United Nations Human Rights Council resolution to recognise issues connected to climate change as having a human rights framework, as well as a picture by Reuters and the Reuters Alertnet about political manipulation of climate refugees and six FAQs about climate refugees. Independent Online, Bangladesh Cimate Refugees: Where will all these people go? We have always maintained that climate change is way more than just an environment issue ... it is a security issue, an economic issue ... in fact it is the most important economic issue of our time, and indeed a human rights issue. GENEVA: Climate change is now officially a human rights issue, as the UN Human Rights Council passed a resolution yesterday on the subject, recognising that the world's poor are particularly vulnerable. The council also gave the green light for a study into the impact of climate change on human rights, describing climate change as a "global problem ... that requires a global solution". The Maldives representative noted that debate on the subject had so far tended to focus on physical effects, while the "phenomenon on human beings" had been largely overlooked. Supporting the resolution, Sri Lanka's representative called it "timely" and said because of climate change, even "the right to life is under threat". The council's resolution acknowledged findings by the landmark report by the Intergovernmental Panel on Climate Change which said the evidence of a human role in the warming of the planet was now "unequivocal", and that the situation could be irreversible. It also cited those most vulnerable to the effects of climate change: low-lying and small island states; countries with low-lying coastal, arid and semi-arid areas or areas prone to floods, drought, and desertification; and developing countries with fragile mountainous ecosystems. Greenpeace political adviser Daniel Mittler welcomed the resolution, saying that it "points to the right direction". "We have always maintained that climate change is way more than just an environment issue ... it is a security issue, an economic issue ... in fact it is the most important economic issue of our time, and indeed a human rights issue. "It has a direct impact on people's lives, the ability of people to lead decent livelihoods. "For example, Africans who can't farm as they used to or Alaskans who can no longer maintain their traditional lifestyle due to climate change effects." However, he pointed out that the study proposed by the council is to be conducted "within existing resources", and said that more should be done to ensure that a thorough study be done. "It's so ironical, if climate change is such a key issue, then countries should put more resources behind it," said Mittler. GENEVA: - Climate change could erode the human rights of people living in small island states, coastal areas and parts of the world subjected to drought and floods, the UN Human Rights Council said yesterday. In its first consideration of the issue, the 47-member forum endorsed a resolution stressing that global warming threatens the livelihoods and welfare of many of the world's most vulnerable people. The proposal from the Maldives, Comoros, Tuvalu, Micronesia and other countries called for "a detailed analytical study of the relationship between climate change and human rights," to be conducted by the Office of the UN High Commissioner for Human Rights, headed by Louise Arbour. "Until now, the global discourse on climate change has tended to focus on the physical or natural impacts of climate change," the Maldives' ambassador to the United Nations in Geneva, Abdul Ghafoor Mohamed, told the session. "The immediate and far-reaching impact of the phenomenon on human beings around the world has been largely neglected," he said. "It is time to redress this imbalance by highlighting the human face of climate change." UN Secretary-General Ban Ki-moon has made the fight against climate change one of his top priorities and has encouraged all UN agencies to incorporate it into their work. Experts say global warming could cause rising sea levels and intense storms, droughts and floods, which would restrict access to housing, food and clean water for millions of people. The Human Rights Council, which wrapped up its latest four-week session in Geneva yesterday, also agreed to appoint an independent expert to assess countries' human rights obligations linked to safe drinking water and sanitation. Under the resolution, that expert will clarify what can be done to stop discrimination in their provision. GENEVA, Switzerland (AP) - The island nation of the Maldives said it made a big step forward Friday toward protecting its very existence, which it fears is threatened by global warming. The Indian Ocean archipelago, which says it risks loosing its entire territory to rising sea levels, leaving its 360,000 inhabitants with no place to go, drummed up enough support in a key UN body to request a study on the impact of climate change on human rights. "We feel it is very important that the Human Rights Council start addressing the issue of climate change," said the Maldives Foreign Minister Abdulla Shahid. "If we look at the consequences of climate change, it is the individual human rights of every person on the planet which is going to be violated, including the right to life," he told The Associated Press by telephone from the Maldives. Some countries were unhappy to link climate change to human rights. Russia said the United Nations already has enough agencies tackling the problem. But Shahid said the Maldives wants the council's work to be complementary to other U.N. organizations dealing with climate change, such as the Nobel Prize-winning U.N. Intergovernmental Panel on Climate Change. The 47-nation council said in the document adopted by consensus that it is "concerned that climate change poses an immediate and far-reaching threat to people and communities around the world and has implications for the full enjoyment of human rights." The Maldives, which consist of 1,200 islands, were joined by other small island countries such as the Fiji Islands and Tuvalu in offering the resolution. They have said they risk disappearing altogether if global warming continues unabated and that the world would see hundreds of thousands of stateless people who have nowhere to go, no government to protect them or to deliver basic services. The 3,000 inhabitants of Papua New Guinea's Carteret Islands, in the far western Pacific, are already preparing to be among the world's first "climate refugees." As seas expand from warming and from the runoff of melting land ice, higher and higher tides are eating away at tiny places like the Carterets, a sandy atoll of a half-dozen islands. Its people are getting ready to abandon the islands over the next several years, resettling on designated land on nearby Bougainville island. Shahid said the inhabitants of the Maldives "don't intend to go anywhere." If significant measures are taken now, the tiny island nation can be saved, he said. "It's not too late, but time is ticking." In December, delegations from nearly 190 countries agreed at a U.N.-sponsored conference in Bali, Indonesia, to adopt a blueprint for controlling global warming gases before the end of next year. But negotiations have proved difficult, with the United States and China -- the world's biggest emitters of the greenhouse gases blamed for global warming -- accusing each other of not doing enough. Washington has argued it should not have to cut its emissions to a level that would hurt the U.S. economy while countries like China and India are not required to make similar cuts. China holds a seat on the rights council, but the U.S. is only an observer. The Maldives foreign minister acknowledged it was difficult to get the big polluters to take real steps to reverse climate change. "The Maldives very well knows that the task ahead is not a simple one, but we will keep going at it," Shahid said. "It's a game of political pass-the-parcel," said Andrew Simms, policy director at British think-tank New Economics Foundation. "No one wants to be left holding the problem of climate refugees." It's a problem with immediate resonance in the nine tiny Pacific islands that make up Tuvalu. Japanese activist and journalist Shuichi Endo has set himself the daunting task of photographing 10,000 Tuvaluans - nearly the entire population - in a bid to draw political attention to the threat they face from global warming. "If industrialised countries like Japan and the United States don't cut their greenhouse gas emissions, the Tuvaluans won't be able to carry on living here," Endo said by telephone from Funafuti island, as children laughed in the background. "Their culture will be lost, the Tuvaluans will no longer exist, and that would be very sad. Here, people live in tune with the natural environment. They don't emit carbon, and we can learn a lot from them," Endo said. No one seems to know where the Tuvaluans would go if their islands disappear - something one study said could happen in just 50 years. Australia has been approached by the islands' authorities, but has not agreed to let the 12,000 islanders resettle there. New Zealand accepts 75 Tuvaluans a year under a regional immigration quota, but has no explicit policy to take in people from Pacific island countries due to climate change. Tuvalu's plight does not augur well for millions of others - from Africa's Sahel region to Bangladesh in south Asia - who could be forced from their homes by climate change. "There is a lack of concern about this right now," said Frank Biermann, a professor at Vrije University's Institute for Environmental Studies in Amsterdam. "A crisis is unlikely to occur before 2030 or 2040," he said. "But if we don't want to see people in camps, violence and other nasty consequences, we need to start planning now." Besides higher sea levels, the UN climate panel warns that rising global temperatures - caused by human activities led by burning fossil fuels - are likely to bring more droughts, flooding and stronger storms. Experts predict climate change-related stresses - including disasters, food and water shortages and conflicts over scarce resources - could permanently uproot 200 to 250 million people by mid-century. A report by EU foreign policy chief Javier Solana and the executive European Commission, to be delivered at this week's summit, says people who already suffer from poor health, unemployment or social exclusion will be hit hardest. The UN refugee agency, UNHCR, has not endorsed proposals to bring them under its mandate, and there is even a dispute over what exactly to call people made homeless by the effects of climate change. "UNHCR is afraid that its capacity to deal with political refugees is already over-stretched, and if you introduce a new element, they simply wouldn't be able to cope," said Simms. Biermann says the refugees should be given legal status through the UN Framework Convention on Climate Change - the international treaty that is the basis for worldwide efforts to reduce global warming and cope with any temperature increases. "We don't want people grabbing their suitcases," he said. "They need new land, new jobs and seeds." Measures that could help vulnerable people adapt to climate change have risen up the agenda at U.N. climate talks. December's meeting in Bali, Indonesia, agreed to launch a UN fund to help poor nations cope with the impact of global warming. "The issue is emerging, even if it's not called climate refugees," Biermann said. Are environmental refugees a new phenomenon? Environmental factors have caused large-scale population movements for centuries, well before we had human-induced climate change. The low sea levels of the Ice Age may have made it easier for people to cross the Bering Straits from Asia to America as long as 13,000 years ago, according to a January 2008 research paper written for the U.N. refugee agency by Etienne Piguet, geography professor at Switzerland's Neuchatel University. There are some well-known examples of the links between climate and migration in the 20th century, too. For example, drought in the plains of the American Dust Bowl pushed hundreds of thousands of people to head for California in the 1930s. And in the early 1970s, drought displaced millions of farmers and nomads from the countryside in Africa's Sahel region to cities. Most academics agree that the term "environmental refugees" first came into public usage in 1985 when Essam El-Hinnawi used it as the title of a report for the UN Environment Programme. In 1990, the first report from the UN Intergovernmental Panel on Climate Change made a specific link between migration and climate change, sayings its effects could displace millions. Are environmental refugees recognised by international law? Despite growing pressure to create an international legal framework for recognising, protecting and resettling environmental refugees, no such instrument exists. What's more, experts say little progress has been made towards resolving their unclear status. According to the 1951 Refugee Convention, the term "refugee" applies to any person who "owing to well-founded fear of being persecuted for reasons of race, religion, nationality, membership of a particular social group or political opinion, is outside the country of his nationality and is unable or, owing to such fear, is unwilling to avail himself of the protection of that country". Elizabeth Ferris, co-director of the Brookings-Bern Project on Internal Displacement, argued in a December 2007 lecture that the use of the term "environmental refugee" was confusing and inaccurate because people forced to flee their countries due to natural disasters weren't entitled to international protection and assistance under refugee law. The terms environmental migrants or eco-migrants have come up as alternatives. Piguet prefers the acronyms EIPM - Environmentally Induced Population Movements - and EDPs - Environmentally Displaced Persons - to describe migration in which people move mainly but not always just because of environmental factors. The often complex mix of environmental, social, political and economic factors that cause people to migrate is one reason why an international definition has been slow in coming. Politics also plays a part, with the U.N. refugee agency and governments reluctant to expand the category of people they are legally obliged to assist. What's the difference between environmental refugees and climate refugees? The two terms are often used synonymously, but experts say the category of "environmental refugees" covers a wider range of environmental factors that could push people to leave their homes. According to Piguet, this includes natural disasters, gradual environmental change, development projects like dams that cause environmental change, industrial accidents, and environmental damage from conflicts. He says the first two are most likely to be linked to climate change. Given the lack of an internationally agreed definition, it's perhaps most accurate to see climate refugees as a group within the broader category of environmental refugees. A group of academic experts has proposed that climate refugees should be defined as "people who have to leave their habitats, immediately or in the near future, because of sudden or gradual alterations in their natural environment related to at least one of three impacts of climate change: sea-level rise, extreme weather events, and drought and water scarcity". Frank Biermann and Ingrid Boas of Vrije University's Institute for Environmental Studies in Amsterdam came up with this definition in a 2007 paper calling for a global system to protect climate refugees. How exactly will climate change displace people? Climate change does not directly uproot people from their homes. It's actually the environmental effects of climate change that make it hard for them to carry on living where they are. That could be sudden weather-related disasters like floods and hurricanes, as well as longer-term events like droughts, desertification and rising sea-levels. According to Piguet, the greatest direct threat comes from sea-level increases, and populations will have to migrate if nothing is done to protect them. He says displacement caused by an increase in floods, droughts and storms is likely to be regional and short-term, and is still very difficult to estimate. In addition, some experts fear dwindling natural resources could fuel tensions that spill over into violent conflict, displacing people. Big energy projects, like dams, could also force people off their land. But establishing a link between these types of displacement and climate change is more complex, as it has been in the case of the war in Sudan's western region of Darfur. How many people will be displaced by climate change? There are no authoritative global estimates, but in 2005, the Tokyo-based U.N. University warned that as many as 50 million people could be fleeing the effects of environmental deterioration by 2010. British-based aid agency Christian Aid says we could be talking about 250 million people permanently uprooted by climate change-related phenomena by 2050. That's based on an interview with environmental scientist Norman Myers, who suggested in 1995 that between 150 and 200 million people would have to leave their homes because of climate change. Myers told Christian Aid in 2007 he believed the correct figure would be closer to 250 million. Will we see a wave of migration from poor to rich countries? The media and politicians often paint an apocalyptic picture of hordes of desperate climate refugees flocking from poor to rich nations. But most experts say this is misleading, because much of the migration caused by climate change is likely to be within countries or at least within regions. Robert McLeman of Ottawa University told a February 2008 event organised by the Royal United Services Institute in London that environmental stresses like droughts usually lead to short-term and short-distance migration as people move from rural to urban areas in search of work. Long-distance migration in these situations is much less common, especially in lean times when people cannot afford to travel or lose household labour. McLeman argued that the best way for rich-country governments to prevent an increase in environmental refugees would be to focus on boosting development and adaptation to climate change in the poor countries that are likely to be the worst affected. Bangladesh Cimate Refugees: Where will all these people go? Dhaka - Abdul Majid has been forced to move 22 times in as many years, a victim of the annual floods that ravage Bangladesh. There are millions like Majid, 65, in Bangladesh and in the future there could be many millions more if scientists' predictions of rising seas and more intense droughts and storms come true. "Bangladesh is already facing consequences of a sea level rise, including salinity and unusual height of tidal water," said Mizanur Rahman, a research fellow with the London-based International Institute for Environmental Development. "In the future, millions of people will lose their land and houses. Their survival will be threatened," Rahman told Reuters. Experts say a third of Bangladesh's coastline could be flooded if the sea rises one metre in the next 50 years, creating an additional 20 million Bangladeshis displaced from their homes and farms. This is about the same as Australia's population. Saline water will creep deeper inland, fouling water supplies and crops and livestock will also suffer, experts say. Government officials and NGOs estimate about 10 million people are already threatened by annual floods and storms damaging riverine and coastal islands. It is unclear how the government could feed, house or find enough clean water for vast numbers of climate refugees in a country of 140 million people crammed into an area of 55 500 sq miles. "We are taking steps to face the threats of climate change. Bangladesh needs $4-billion (about R31-billion) to build embankments, cyclone shelters, roads and other infrastructure in the next 15 years to mitigate the threats," Mohammad Aminul Islam Bhuiyan, the top bureaucrat in the government's Economic Relations Division, said. "These are big challenges and only time will say how efficiently we address them, including finding accommodation for the displaced millions," he said. In a taste of what the future might look like, Bangladesh suffered two massive floods and a cyclone last year that together killed about 4 500 people, made at least two million homeless and destroyed 1,8 million tons of rice, the country's main staple. Even without the additional threat of global warming, the country's future is under pressure from a rising population and shrinking farmland. The country lost a third of its agricultural land to accommodate more people as the population rose from 75 million in 1971. "We are conducting various studies to find options to save future environmental refugees," said Sakil Ahmed Ferdausi, a World Bank executive in Dhaka. "The environmental refugee situation will turn into a dangerous problem in the future and the Bangladeshi government may find it difficult to face the challenge. So we asked donors to help the country," Ziaul Haque Mukta, of Oxfam International in Dhaka, said. For Majid, the issues are more immediate. He lives on Batikamari island on the Januma river, 300 km north of Dhaka and fears his remaining days will be spent on the run from the river, which is constantly creating and retaking land, depending on the season. "Migration rate is very high among the islanders," Runa Khan, executive director of Friendship, said. "We have covered 3,5 million people in Bangladesh's riverine islands but many more are still left." Friendship operates a floating hospital to provide health care to the islanders. It has treated 600 000 people since 2001. But climate change could wipe out their nomadic lifestyle altogether. "Where will all these people go?" asked Mohammad Nurul Islam, a resident of Cox's Bazar on the shore of the Bay of Bengal. CLIMATE change expert Nicholas Stern says he underestimated the threat from global warming in his watershed report for the British Treasury in 2006. His comments echo Ross Garnaut's warning in his interim report for the Rudd Government on climate change from February that the world is moving towards high risks of dangerous climate change more rapidly than has been generally understood. The Australian understands the two economists have been in discussions. "The work Professor Garnaut is doing has been very interesting to Sir Nicholas," a source said. Sir Nicholas said in London yesterday: "Emissions are growing much faster than we'd thought, the absorptive capacity of the planet is less than we'd thought, the risks of greenhouse gasses are potentially bigger than more cautious estimates and the speed of climate change seems to be faster." In his interim report, Professor Garnaut said that developments in mainstream scientific opinion suggested the world was moving towards high risks of dangerous climate change. "The largest source of increased urgency is the unexpectedly high growth of the world economy in the early 21st century, combined with unexpectedly high energy intensity of that growth and continuing reliance on high-emissions fossil fuels as sources of energy," Professor Garnaut said. "These developments are associated with strong economic growth in the developing world, first of all in China. "The stronger growth has strong momentum and is likely to continue." According to the interim Garnaut report, scenarios prepared by the Intergovernmental Panel on Climate Change presume continued reductions in the energy intensity of global growth along the lines of the late 20thcentury. "Energy intensity of Chinese growth in the 21st century has been far higher than in the 1990s," he said. Sir Nicholas said the latest climate science showed global emissions of planet heating gases were rising faster and upsetting the climate more than previously thought. He warned evidence was growing that the planet's oceans, an important carbon sink, were increasingly saturated and unable to absorb as much carbon dioxide as previously. John Connor, from the Climate Institute, agreed with Sir Nicholas's prognosis. "Some people still keep talking about uncertainty on the upside; the reality is that there is also uncertainty on the downside," he said. "Most science since the IPCC has been on the downside."